I like twin beds in a guest room. They are more flexible, and you can accommodate different combinations of guests more easily. When we started our Guest Room Refresh for the Spring 2019 One Room Challenge, we had two Espevar foundations from Ikea. These are simple platform beds made from pine, unfinished, and easy-to-assemble. Ikea sells covers for the Espevar, but we wanted to customize the beds ourselves. To give them a little 1950s flair, we took two steps: painting and then adding hairpin legs. The first step in sprucing up our Espevar foundations was to paint them. The Espevar is basically a pine frame. It is untreated, so we didn’t even have to sand it. Our wall color is Kelly-Moore Aqua Ocean. So for the bed frames — and the shelves on the headboard — we went two shades darker choosing the perfect color: Hawaiian Vacation (KM 5062-2). Since the entire room is inspired by a vintage map of Hawaii, it could not have been more perfect! It took two coats of paint — less than a quart — and they look fantastic! Stacking the beds made it much easier to paint inside. The Ikea Espevar bed foundations don’t come with legs, but in good Ikea fashion there are several choices available. Because our beds used to be in two different rooms, they didn’t have matching legs. But rather than finding a match, we decided to add a little more 50s character to our now-aqua frames. I have ordered from DIYHairpinLegs.com several times, and their legs are awesome! They come in multiple color choices, and they arrive quickly! So, an order for 8 white legs went off. This was a significant portion of our One Room Challenge budget, but the legs are still an economical choice overall. We chose a 12” tall leg — slightly taller than normal for beds, but this gives our guests the option to store suitcases under the beds and can be more comfortable for some guests. 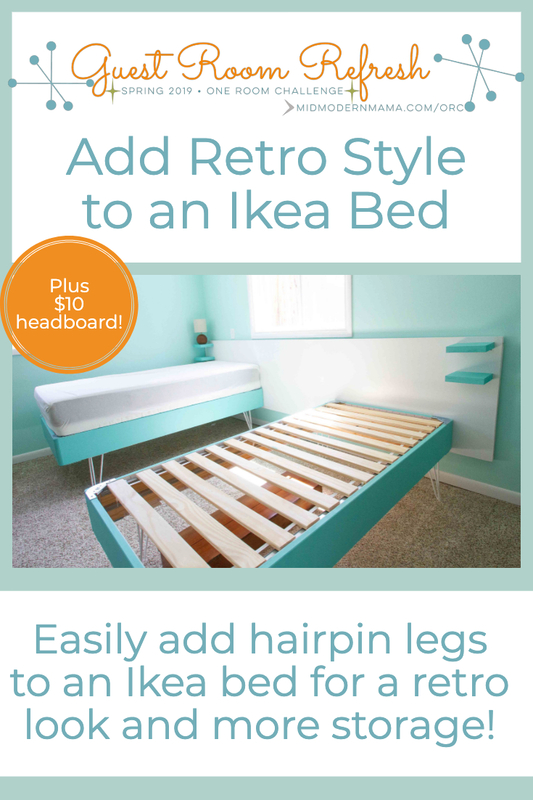 Of course, the Ikea bed isn’t configured to take hairpin legs, so we had to adapt it slightly. But the solution is both easy and inexpensive. 1. Attach the 2x4 to Espevar’s side pieces with a screw. 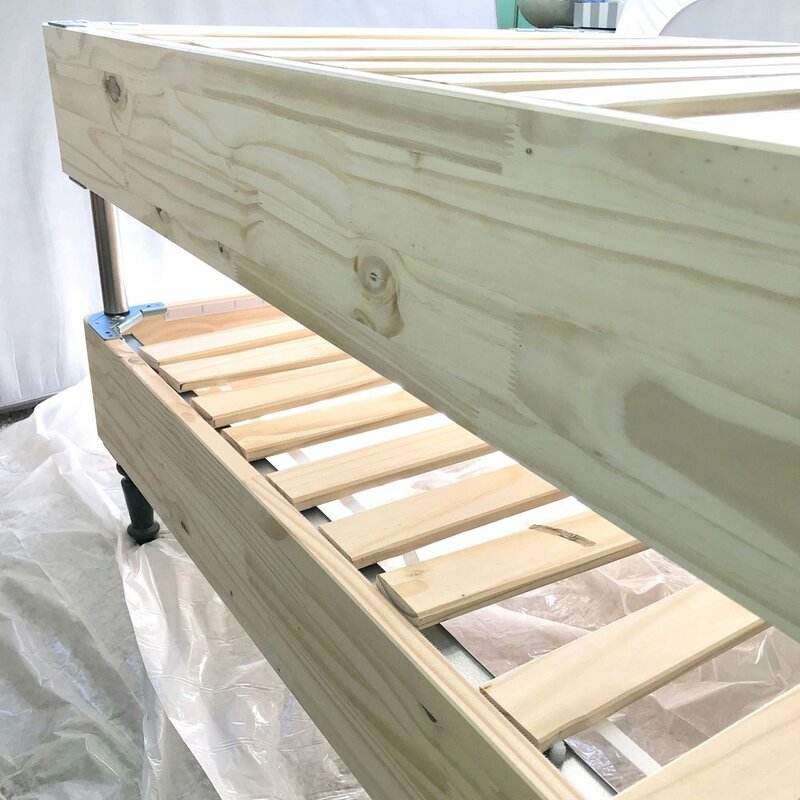 Flip the assembled bed platform upside down and measure the width inside the side rails. This is the length to which you should cut your 2x4. Put the cut 2x4 into place resting on top of the metal rail. Fix it in place using a screw at an angle on each end. 2. Mark and pre-drill the holes for each hairpin leg. Place each hairpin leg, and mark the holes. Pre-drill for each screw. Two screws will go into the edge of the bed foundation. Two will go into the 2x4. Attach each leg using 4 screws. 4. Each end will look like this when complete. When completed, flip the bed over, replace the slats which support the mattress, and then place the mattress on top. Espevar with hairpin legs flipped upside down. Completed project without the mattress platform. We actually feel the beds are sturdier now with this additional cross support, and we love how they turned out! You could even use taller legs if you want to gain a lot of storage space underneath. This was just part of a bigger project, and we created really cool and inexpensive headboards for the Esepvar beds. Check it out below! And to see the progress of the entire Guest Room Refresh, click on the link below!